With Level 5 taking the rest of the RPG world by storm, we’ve been wondering: where the hell is Dark Cloud 3?! 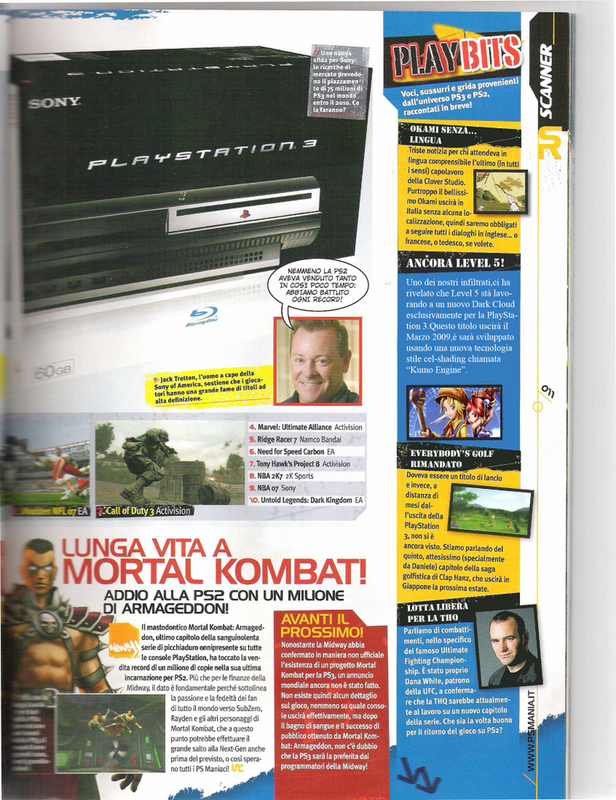 It may be nothing but hearsay, but Italian magazine PSMania thinks they’ve scooped the first info in their rumor section. Never heard of the “Kumo Engine” before, to be honest, but 2009 seems like a reasonable date considering that they’ve got to get White Knight Chronicles out the door first. Exclusivity is expected (the series has only ever been on Playstation platforms), even though it’s a pretty easy claim to make at this point. Edit: Apparently this is actually an issue from 2006, so yeah…sorry? Doesn’t necessarily discount the possibility (since it’s a very likely proposition in the first place), but it’s nothing new. ~ by Cavin Smith on October 13, 2007.
real fake guys. it’s a photoshopped scan… don’t u see the font is absloutely different? the truth is, the original news was about a boxing game for psp and not about a dark cloud 3 launch date. this guy covered the original with his stuff. if you want, i can give you a JPG of the original page featured in PSMANIA issue 71 as of februrary 2007, page 011. trust me and spread this upadte plz. I love Dark Cloud games and as much as I want it to be true it probobly most likely isnt. What the crap!Is there a freeking dark cloud 3 in the making?Or is it a hoax?Ive been waiting for a year for it i got every weapon on both of the others almost!And ive restarted three times i need another game of dark cloud so when is it coming??!? Look how clean the font is, no distortion, yet it’s from a scan? That and it’s Times New. No magazine publishes in Serif Font. Shopped picture. The shade of white in the font of the Dark Cloud item and the white in the font of the item at the bottom of the column is distictly different (the white at the bottom is dirtier). You can also tell the blue in the rumour box is different from the blue in the bottom box. The picture is also fishy – there’s no shadow at the sides like there is with the other pcitures. The dead giveaway has got to be the box itself, though. Compared to the rest of the boxes, the colour fill of it is clean as a whistle. Not a visible pixel off-colour, as opposed to the other boxes which are of much poorer quality. The only way you’d notice any distortion on that is to magnify it. How stinky for somebody to fake a new dark cloud game! i hope its better than th second one, the second one annoys me. Toan is cool. Max is not. HA. I want to see TOAN again! I hope the 3rd one (if made) has a Toan. Toan is great.